Smaller than a fingernail, like bits of downy red feathers, baby tubeworms cling to a vertical wall towering alongside the submersible Alvin 2,500 meters beneath the sea in 2006. Repaved with fresh rock during an eruption at the East Pacific Rise, the walls mark the edge of the caldera of a deep-sea volcano. We three—pilot Pat Hickey, biologist Timothy Shank, and I—are the first human observers of these new colonizers, which are still so young they don’t yet have tubes to protect them from hungry crabs. Fresh rock on the seafloor is typically a glassy, iridescent black color, but these rocks are coated with a thick layer of white microbes. The key to all this new life is the warm, shimmering, chemical-rich water bathing them. Pressing my face to the 4.5-inch-round window, I have just encountered my first black smoker hydrothermal vent, where hot fluids, laden with chemicals and minerals, spew like smoke from chimney-like rock formations. We have sampled fluids from the vent, collected rocks and animals around it, and seen how the gills of baby tubeworms flutter in the current. 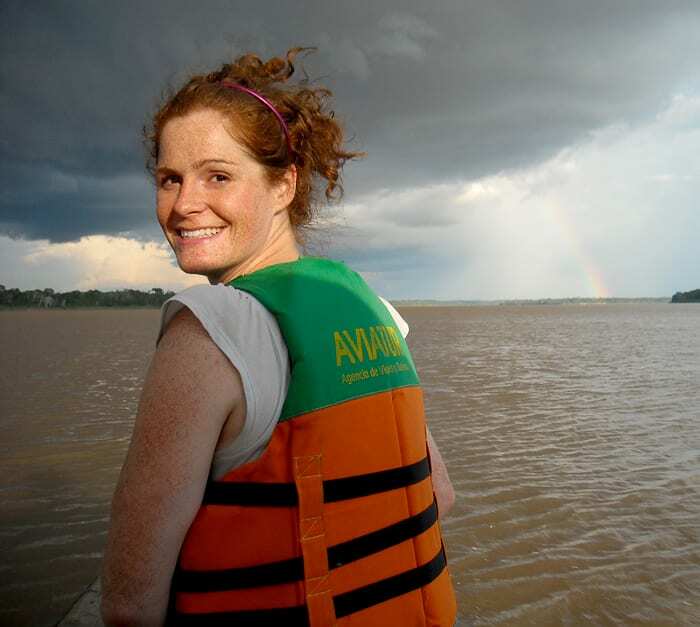 I grew up far from the ocean, on the Canadian border in Maine, but my interest in hydrothermal chemistry was sparked when I met Karen Von Damm, a professor at the University of New Hampshire. Karen was an MIT/WHOI Joint Program graduate student in the early 1980s. She wrote her Ph.D. dis­sertation on the chemistry of the fluids gushing from the first deep-sea black smoker hydrothermal vents sampled on a mid-ocean ridge. Karen, who died in 2008, devoted her life to understanding how vent fluids acquire their chemical composition, and how those chemicals support biological communities and affect the ocean. I landed in Alvin thanks to Karen’s dedication to mentoring young scientists, coupled with her firm belief in the value of seeing a hydrothermal system firsthand. Three years later, I found myself aboard the research vessel Cape Hatteras as part of a group of oceanographers, astrobiologists, engineers, and crew members hunting for new hydrothermal vent sites in a different ocean. We were hoping for the first glimpse of the deepest black smoker on Earth. We were in the Caribbean Sea south of Cuba, at the Mid-Cayman spreading Center. Here, two of Earth’s tectonic plates—the Gonave and North American Plates—are splitting apart. As the plates separate, molten rock from Earth’s interior wells up, creating fresh rock on the ocean floor. Cold seawater circulates down through cracks in the fresh, still-hot rock and is heated, driving chemical reactions that transform seawater into hot, buoyant, mineral-rich fluids that rise to the seafloor. Because of the high pressure at seafloor depths, fluids at the hottest vents can reach temperatures far beyond the 100°C (212°F) boiling point at sea level. At the seafloor, vent fluids cool rapidly and precipitate metal sulfide minerals that are deposited on the seafloor as chimneys. Black smoker chimneys and areas around them are usually thronged by microbes and animals that derive energy from chemicals in the fluids—in contrast to most environments on Earth, where light energy and photosynthesis provide the basis for life. The Mid-Cayman Spreading Center is a small part of the mid-ocean ridge system, a continuous 40,000-mile range of volcanic underwater mountains that spans every ocean and encircles the Earth. Like most of the mid-ocean ridge system, the Mid-Cayman Spreading Center to this point has remained unexplored. 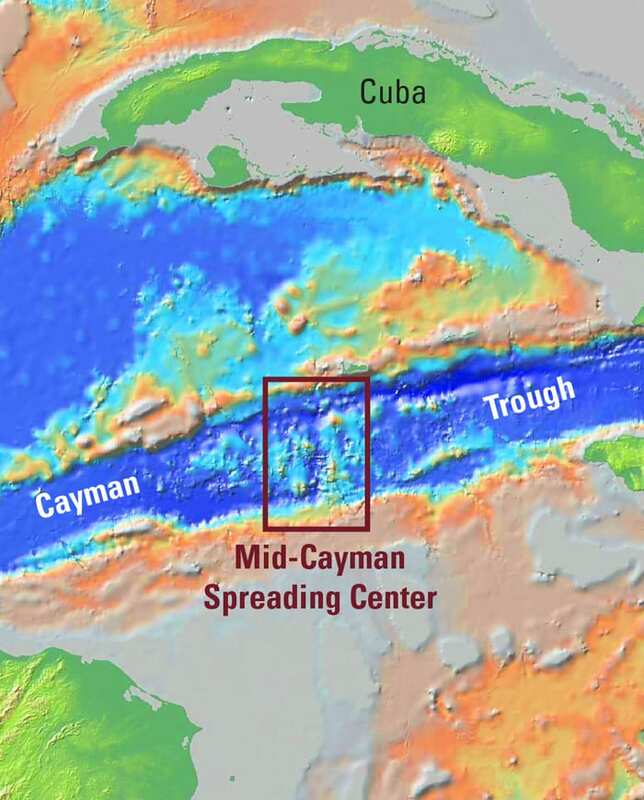 The Mid-Cayman Spreading Center, however, has attributes that distinguish it from other mid-ocean ridges. It is deep and geographically isolated from its nearest neighbor, the Atlantic Ocean. It is also spreading at an ultraslow rate of less than 1 inch per year. These characteristics may endow its vents with geochemistry and life forms not seen at previously explored sites. Our work was led by Chris German, a geochemist at Woods Hole Oceanographic Institution (WHOI). It was part of a NASA-funded endeavor to identify geologic, biologic, and chemical clues to the origin and evolution of life on our planet, and perhaps on other planetary bodies. 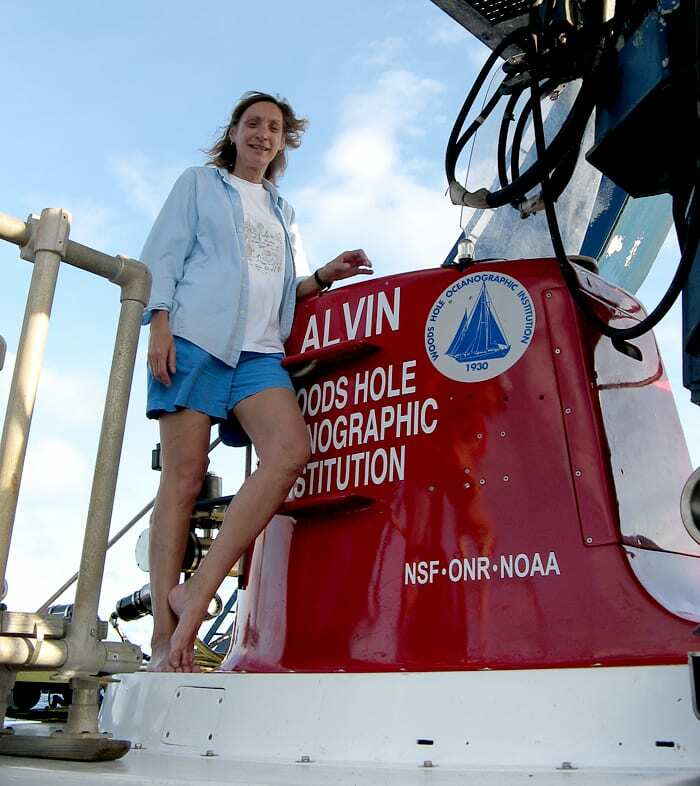 At 5,000 to 6,500 meters (3 to 4 miles) deep, the seafloor below the Cape Hatteras was more than twice as deep as the site of my first dive and at present too deep for Alvin. Any vent or organism on the seafloor here feels pressure at least 500 times greater than that on the Earth’s surface. The Mid-Cayman Spreading Center may be home to organisms that have adapted to extreme conditions. A vent ecosystem here could be our closest analog to life elsewhere in the solar system. One possibility for that is the 50- to 100-mile-deep ice-covered ocean of Europa, a moon of Jupiter. As a student in chemical oceanography, I am working with WHOI scientist Jeffrey Seewald. Our lab analyzes the dissolved gases and organic molecules in vent fluids that provide critical energy to deep-sea hydrothermal ecosystems. We wonder how the extreme pressure at the Mid-Cayman Spreading Center will affect the maximum temperature of vent fluids. Laboratory experiments have determined that they could be higher than the hottest vent yet discovered, which measured 407°C (765°F) at a depth of 3,000 meters (1.9 miles). We also intend to analyze the chimneys and mineral deposits surrounding active vent sites, which offer chemical clues about the underlying rocks that seawater chemically reacted with to produce vent fluids and chimney formations. Rocks at ultraslow-spreading mid-ocean ridges such as the Mid-Cayman are often composed of minerals that are typically found deep in the ocean crust but that would have been more common at the seafloor when Earth was newly formed. Chemical reactions with these rock types could have produced organic molecules that served as a pre­cursor to life in early Earth environments. The chimneys and rocks around vents also provide habitats for microbes, which are at the base of the community food web. Before our 2009 expedition, nothing was yet known about the fauna that may inhabit vent environments within the Mid-Cayman Spreading Center. One longtime conundrum we pondered is why we had found certain hydrothermal vent tubeworm species only in the Pacific. We hypothesized that organisms at Mid-Cayman vents could represent a link between the differing species that inhabit vents in the Pacific and the Atlantic. How do you locate a hydrothermal vent, which may occupy less than a square meter along a 2,000-square-kilometer (772-square-mile) area of seafloor spreading, more than 5,000 meters (3 to 4 miles) beneath your ship? Despite how grand vents look close up, finding a single chimney across miles of total darkness on the seafloor is like finding a needle in a haystack. On average, there is about one vent site for every 100 kilometers (62 miles) of mid-ocean ridge, so it followed that there should be just one vent site along the entire Mid-Cayman Spreading Center. We didn’t want to miss it! 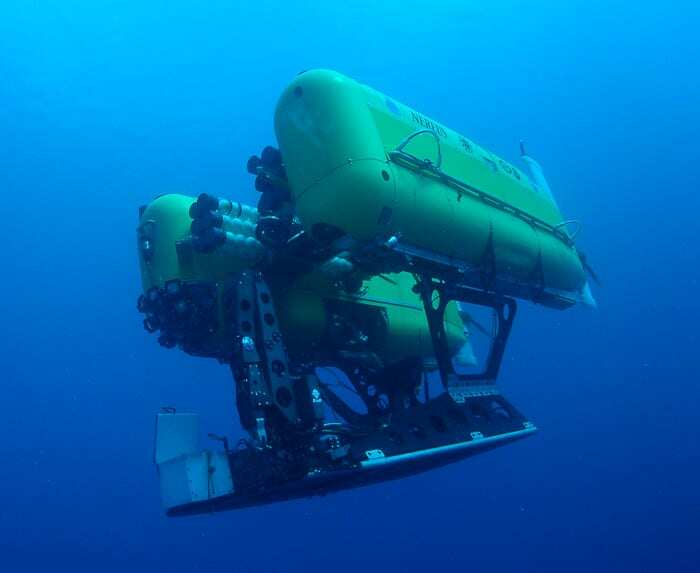 The Cape Hatteras was equipped with a plethora of vent-hunting tools, including towed sensors and water bottles, and Nereus, a cutting-edge unmanned vehicle built to work under crushing pressures. Nereus has two distinct functions. In an autonomous mode, Nereus is not tethered by a cable to the ship. It is programmed to descend to the seafloor and “mow the lawn,” driving over partially overlapping swaths of seafloor to create high-resolution maps of the bathymetry of the ocean floor. These maps provide insights into the geological context of a hydrothermal vent—for example, whether it is near a lava flow or a fault in the ocean crust. Alternatively, Nereus can be switched to a battery-powered remotely operated mode, in which it is tethered to the ship via only a thin fiber-optic cable and carries cameras and sampling equipment. The cable transmits real-time images to pilots aboard ship, who send commands via the cable to steer the vehicle and control a manipulator arm and other instruments. Aside from the danger of sunburn, there is one common problem with working in the tropics, particularly in the fall: tropical storms. After three nerve-wracking dives with Nereus, we were homing in on a hydrothermal vent, but tropical storm Ida put an end to our Nereus operations. Fortunately, we had other tools that are less sensitive to choppy waters, and we continued to use towed sensors and chemical analyses on seawater samples we collected. 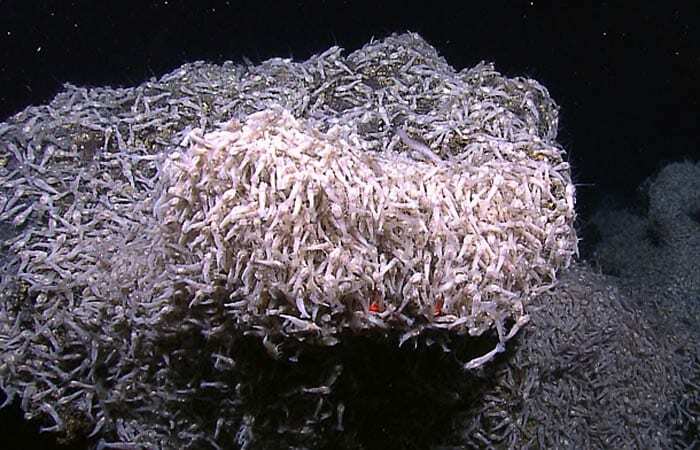 Although a hydrothermal vent site may occupy only a square meter on the seafloor, the hot, chemical-rich buoyant fluids from vents can rise hundreds of meters above the seafloor and then spread out horizontally like smoke from a smokestack. These plumes can provide a wealth of information about the vent. With towed sensors, we took real-time in situ measurements to detect the high abundance of particles and low abundance of oxygen in seawater that signified plumes. I measured the amount of methane dissolved in seawater samples. Although methane is a gas on Earth’s surface, it is dissolved in liquid form at the pressures and temperatures within a vent. Within a plume, the ratio of methane to metals such as manganese is indicative of a vent’s fluid temperature and the type of rock that chemically reacted with seawater during circulation through the oceanic crust. In addition, our team identified elevated concentrations of key microbes associated with vents in these plumes. At the end of the 2009 cruise, we had identified plumes from three different areas of venting within the Mid-Cayman Spreading Center, including two high-temperature black smoker vents and one lower-temperature site. Guided by our initial evidence of plumes and hydrothermal vent activity, an international team led by Jon Copley of the National Oceanography Centre in Southampton, U.K., returned five months later to the Mid-Cayman Spreading Center and took camera footage that confirmed two active vents. At just under 5,000 meters, one was the deepest vent discovered to date. 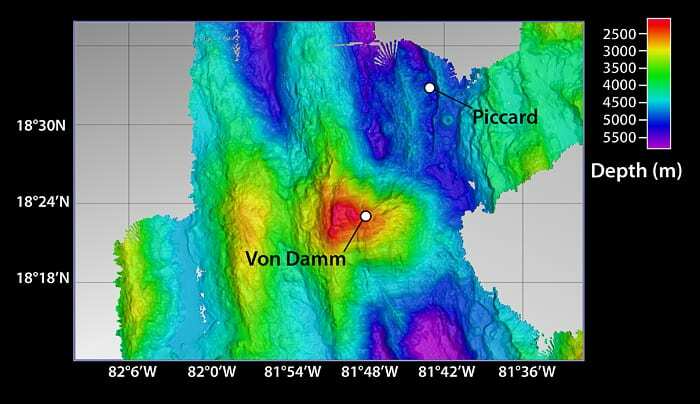 One site is named after the renowned undersea explorer Jacques Piccard and the other after hydrothermal chemist Karen Von Damm, my mentor. In August 2011, WHOI’s Chris German led another expedition, aboard the NOAA ship Okeanos Explorer, which returned to the Mid-Cayman Spreading Center and made a breathtaking discovery. 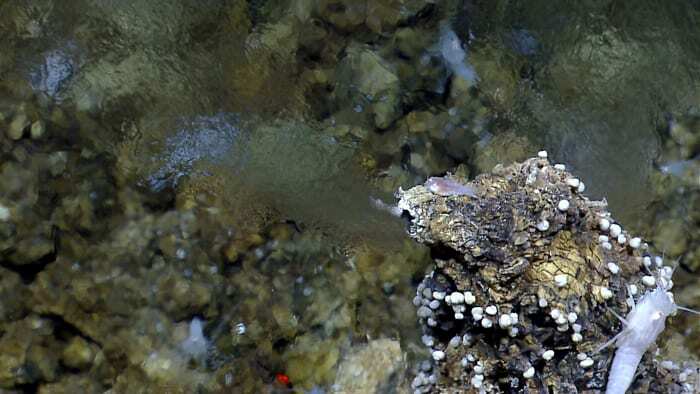 “We were witness to the first discovery of a live hydrothermal tubeworm at any vent site in the Atlantic,” German said. In January 2012, now funded by the National Science Foundation as well as NASA, our team is returning to the Mid-Cayman Spreading Center aboard Atlantis with the remotely operated vehicle Jason. The Mid-Cayman vent sites hold great promise for learning how organic molecules and microbes may have coevolved on early Earth, how deep-sea animals evolved and dispersed throughout the ocean, and how extremely high pressure can affect hydrothermal vent-fluid chemistry. We cannot wait to get back to collect samples of Mid-Cayman hydrothermal vent fluids, rocks, and whatever organisms await us. Additional funding for this research came from the Deep Ocean Exploration Institute and Ocean Ridge Initiative at WHOI.